Our kitchen blackboards and mini chalkboards are made with the finest materials available to ensure that they uphold your establishment's quality. Unlike our competitors, we use heavy Beech wood for the base, moulded to our own design. We use Beech wood as it is a very dense material and therefore does not soak up moisture if the boards are placed on bars or tables. 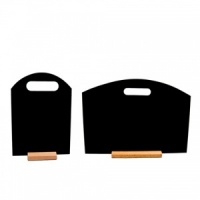 The chalkboard surface is high quality and is perfect for use with Liquid Chalk Pens as well as traditional chalks. Take a look at our range of kitchen blackboards below. With boards available in a range of shapes and sizes, you're sure to find the kitchen blackboard which is perfect for your needs. We are your one-stop shop for blackboards and, remember, all prices include VAT! If you need a large quantity or are a trade customer, get in contact with us directly and we can give you relevant price breaks on the products you require. All of the materials used to craft our Chalkboards have been researched to ensure that they all come from sustainable sources, this helps us to maintain our quality and our carbon footprint.